The Large Münsterländer is one of the all-around gundogs. It is capable of pointing, trailing game, flushing and retrieving from both land and water. The Large Münsterländer was developed in Germany and is descended from the German Longhaired Pointer. 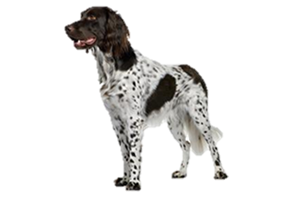 When German gundogs were separated into individual breeds in the 19th century some breeders did not agree with the exclusion of black and white coloring in the German Longhaired Pointer. Breeders in Münster specifically continued breeding their black and white dogs and eventually they gained separate recognition as the Large Münsterländer. Is the Large Münsterländer Right for You?